As Valentine’s Day approaches, I find myself looking in my closet for all things red and pink, of course. I love themes, and Valentine’s Day is actually one of my favorite holidays to choose outfits for! This dress (worn as a top) and skirt went together well to create a simple, yet romantic look that I’m certain I’ll wear out on Valentine’s Day this year if we are going out to dinner somewhere. This look is inspired by a holiday style worn by Rachel from Pink Peonies, and I thought it would be a beautiful combination for Valentine’s Day. It is simple, yet romantic and I think this skirt will definitely be something I wear for Valentine’s Day (and good news it is under $30)! So cute and you look gorgeous! Totally perfect for Valentine’s Day! You look so pretty! I love this look on you. I might need that skirt! Such a pretty look! 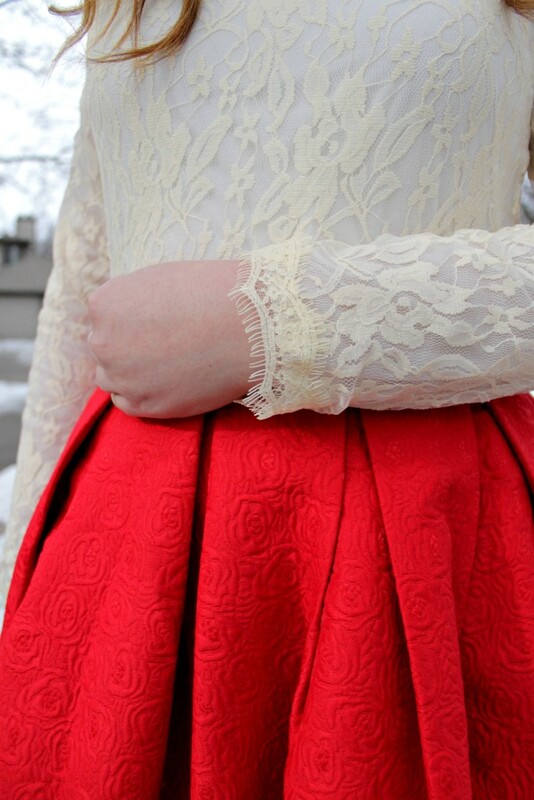 I love the lace and the skirt is perfect for V-day!! that skirt is a dream and perfect for Vday! I love how bold the red is against the ivory. This is such a cute look! So pretty!! Love that red skirt!! I remember this Pink peonies outfit! What a gorgeous reinterpretation and perfection for Valentine’s Day! Loved this when I saw it on Insta! You look gorgeous girl! Red is a great color on you. I think full midi skirts are so flattering. Every time I see one, I wonder why I don’t own one?! Prefect outfit for valentines day. You look fabulous. Lovely Outfit! Red is my favorite color to wear this time of year. You look absolutely Stunning! Love that skirt. Almost bought it but I had to stop myself. lol. I love that we are twinning in today’s post. DO people say twinning anymore? lol! lets do brunch soon! In love!! I love that you took a dress and made it a top, i have a similar dress I should try that with! Now I want your skirt, we should switch!! LOL Love this outfit Rachel, stunning!! 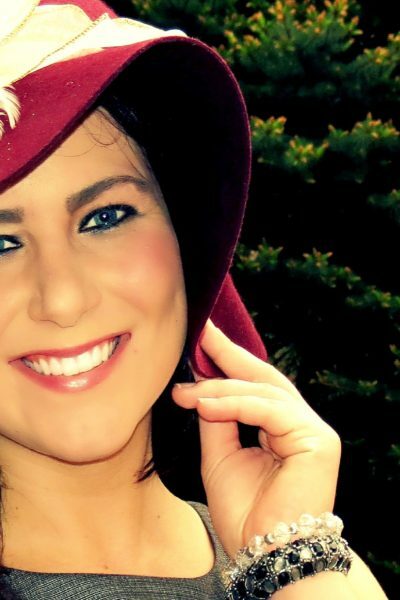 This is a wonderful Valentine’s Day look! Love your style and your blog 🙂 I have a blog as well and I am from minneapolis as well (currently living in Oregon) but i think it is so cool you are from there and I am so inspired by you 🙂 Hope you are staying warm! Rachel, you look stunning!!! I love how romantic this look is…gorgeous! Midi skirts for the win!! LOVE that skirt! The color and texture are perfect! What a BEAUTIFUL Valentine inspired outfit. Lately I have been dying to get my hands on a skirt such as this, thank you for providing the link as I will check it out. You look lovely! Oh so beautiful! Love love love that red skirt, it makes me want to go shop for a skirt. I need to start planning some Valentine day outfits for myself before it’s too late. This is such a pretty outfit! I love that skirt– it looks amazing on you! So romantic + gorgeous! I love the bright skirt and that bright lip on you- amazingggg! Love that outfit, it’s so cool the red skirt is pure perfection! You look gorgeous, this dress is so pretty too! 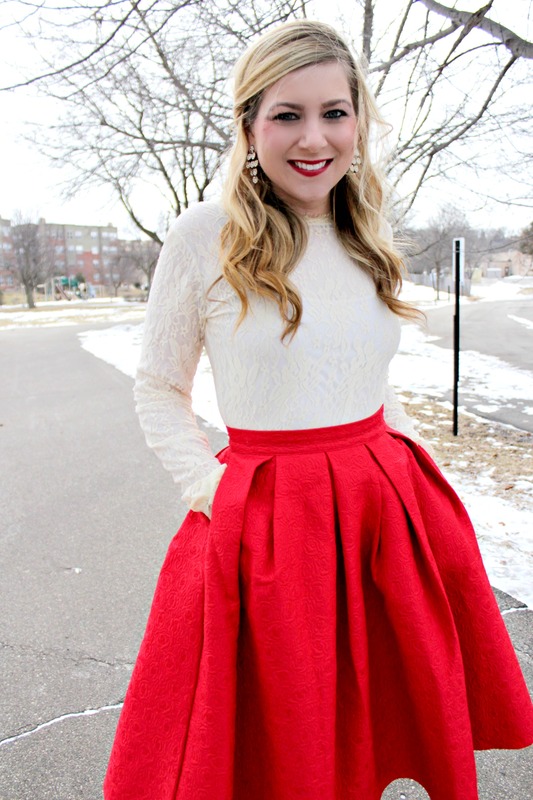 That vibrant red skirt could not be a more perfect choice for valentines day! Love it paired with the cream. So elegant. You look so so gorgeous! I was just thinking today that I wish I had a red skirt to wear for Valentines! So pretty! I love this romantic outfit! Very cute look Rachel. What’s not to love about red and lace. The perfect Valentine’s combo! I am loving full bodied skirts and this suits you so much! Rachel!!! This is one of my favorite outfits of yours – so romantic and feminine and beautiful!!!! And your hair is looking so pretty, too!